Robert Scott Burn wrote this book in 1871 at a time of great developments in science, industry and exploration, and when materials for engineering and building were constantly being improved and replaced. It offers, therefore, a useful coverage of both traditional techniques and materials such as stone, brick and pise, but also examines the developments in the use of cement for wall covering as well as cement blocks to be used as artificial stone. 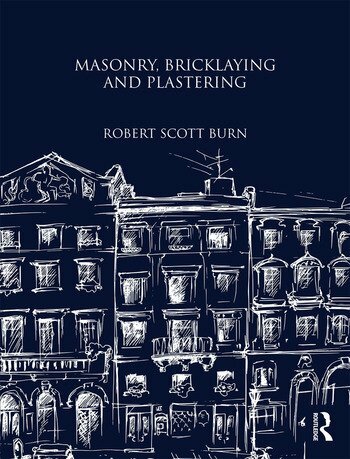 This reprint of the original work contains over 400 pages of text dealing with materials, practical construction techniques, masonry and brickwork, principles of design, drawing, plastering and wall decoration, as well as many other aspects of construction. The 160 plates which accompany the text include a large number of drawings of different parts of buildings, including: window, door and wall details in various styles; arches; staircases; consoles and brackets in stone and terracotta; hollow and ornamental brickwork and designs of shop fronts. Materials employed in construction: Stones - their varieties, constituents and natures; Bricks; Limes, cements, mortars, concrete, beton; Metals; Practical construction in masonry and brickwork: Foundations; Formation of embankments for reservoirs, riverbanks and sea margins; Stone cutting - shaping of stones for arches, groins, domes, niches, steps; Stone in buildings of walls - retaining walls, arches; Brick in building - bond, hollow walls, vaults, groins, arches, prevention of damp in walls, modes of using mortar; Earth, cement and concrete in the formation of walls; Timber and iron in conjunction with mortar, concrete stone and brick in fireproof construction; Appliances used in building - tools, machines, scaffolding, hoists; Principles and practice of design: General view of the styles of architecture; Styles of domestic architecture; Principles of design; Application and working of styles - the classical orders, their parts and proportions, mouldings, domestic, Gothic, Elizabethan and Italian styles in doors, windows and chimney shafts; Practical drawing, projection, intersection of solids, development of surfaces, projection of shadows, perspective; Planning and designing domestic structures; Sanitary arrangements and economical appliances of buildings; Plastering and wall decoration in plaster and other recently introduced materials; Specifications, measurement and estimates.